Being a fan of Kristan Higgins’s BLUE HERON series ( I may have come close to shedding a tear or 2 when that series ended), seeing Kristan enter the world of women’s fiction was so nice with her If You Only Knew and On Second Thought is another breath of fresh air. When Kate married Nathan, she expected her life to be complete. He was the man she’d been waiting for. Nathan dying was an unexpected twist in her forever plans. However, it’s an interesting twist- because Nathan was so perfect- but if you only know someone for a short while- it’s easy to see the perfections. Ainsley, on the other, hand knows her boyfriend’s faults, They’ve been together for 11 years and she is just waiting for the day that he says “Be my wife”. Alas, the death of Nathan shakes up both of the sister’s lives. The cover. Tulips are my fave and I love the simplicity and elegance of the cover. The relationship between the sisters. Sure, they’ve had rough times over the years. Sure, they’ve had some crappy fortune lately. But when the chips are down- these girls are there for each other and discover much about themselves and each other. Bottom line: I really enjoyed this book! If you are a fan of Kristan Higgins from her Blue Heron series- you’ll enjoy On Second Thought. New to Kristan? Sit down a spell and enjoy a story of two sisters and the mess and greatness of their lives. 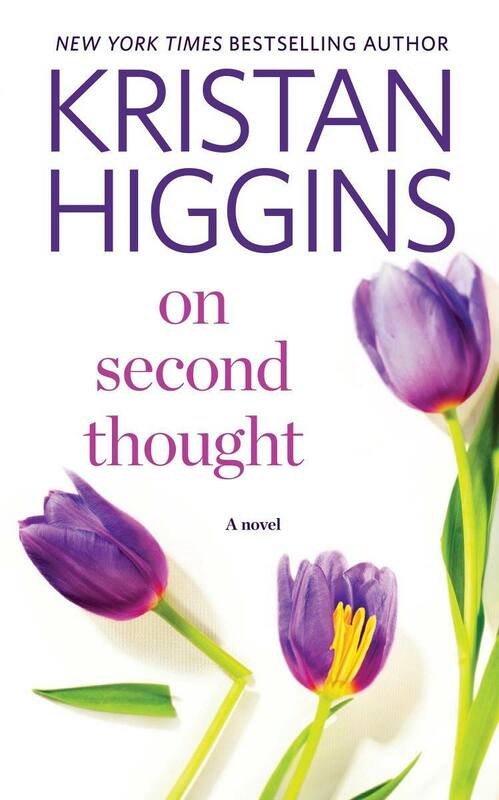 Having read several of her contemporary romances I’m a fan of Higgins. I was pleasantly surprised by her women’s fiction novels. I really liked this one. I’ve only read her women’s fiction books and Blue Heron series. Any other faves I should check out? This is my current read. I am enjoying it! Me too! I thought it was VERY enjoyable!